From state and local GIS departments storing and analyzing spatial data in AWS to universities developing cloud capabilities to meet the needs of students on campus, our customers are realizing the benefits of the AWS Cloud. Learn from some of the cloud pioneers here. The success of trailblazers can help us understand the journey, the transformation, and what organizations need to do to adopt AWS effectively. The Stages of Cloud Adoption articulate the cloud journey, which is further explained in a series of posts on our Enterprise Strategy Blog. The Guidelines on Developing Effective Cloud Adoption Strategies, developed by our AWS Professional Services team, also provide starting points for understanding cloud adoption and migrations. 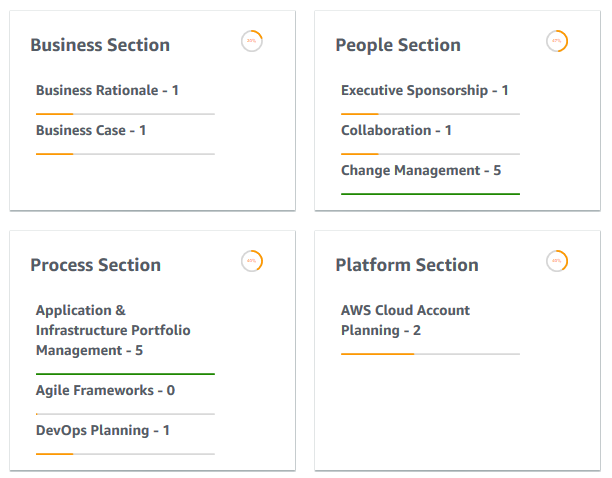 A new tool that helps customers more easily assess their capabilities, understand how to ready themselves, and follow proven blueprints for operating their business in AWS is the Cloud Adoption Readiness Tool (CART). The CART is a self-service assessment tool that asks 16 questions and provides a read-out report, which contains recommendations on where you should spend time developing specific capabilities. These recommendations include prescriptive actions you can take to get started – actions ranging from re:Invent sessions to watch, AWS Free Tier projects to complete, or whitepapers to review. CART is the first step to help teams get started in the Project Phase of Adoption in AWS. Public Sector organizations can accelerate their cloud adoption journey and migration to AWS with the new tools and prescriptive guidance available. Take the 16-question CART online survey and download your customized cloud migration assessment report that rates your responses and highlights what you can do to become cloud ready. Dive into some of our other assets to support public sector cloud adoption and migrations: Migration Acceleration Program, Migration Hub, Well-Architected Program, and AWS Professional Services.